Its raining today. Thats not so significant, since I do live in Oregon, but this is our first real rainy day of the winter to come. Dont get me wrong, Southern Oregon is considered the banana belt and though not tropical in the least, we do have more good weather than most of the rest of Oregon and its stunningly beautiful! So why did I start this post with a weather report? Because this isnt mist-of-a-new-season kind of rain, this is full-out-stay-indoors kind of rain and for some reason when its raining like that, I crave comfort food. When I was a kid and my parents would go out on a date, we kids got a babysitter and a frozen Swansons pot pie of our choice; beef or chicken. Oh how I loved those little pies with their golden crusts and the juicy gravy oozing out of the sides! We never got to have them except on date night, so they were very special in my little girls heart. As an adult, I found them less than satisfying, but in my memory bank, pot pies rock! Well here, my friends, is a pot pie that delivers all the comfort Im looking for and even adults will love it! Bring broth to a boil in a large Dutch oven. Add peas and next 5 ingredients (through onions) to pan; cover, reduce heat, and simmer for 6 minutes. Add chicken; cook for 5 minutes or until chicken is done. Remove chicken and vegetables from broth with a slotted spoon; place in a large bowl. Place all but 1 tablespoon flour in a medium bowl; gradually add milk to bowl, stirring with a whisk until well blended. Add milk mixture to broth; cook for 5 minutes or until thickened, stirring frequently. Stir in chicken mixture, parsley, thyme, salt, and pepper. Spoon mixture into an 117-inch baking dish coated with cooking spray. Sprinkle remaining 1 tablespoon flour on a work surface; roll dough out and place over chicken mixture, pressing to seal at edges of dish. Cut small slits into dough to allow steam to escape; coat dough lightly with cooking spray. Place dish on a foil-lined baking sheet. Bake at 400° for 16 minutes or until pastry is browned and filling is bubbly. 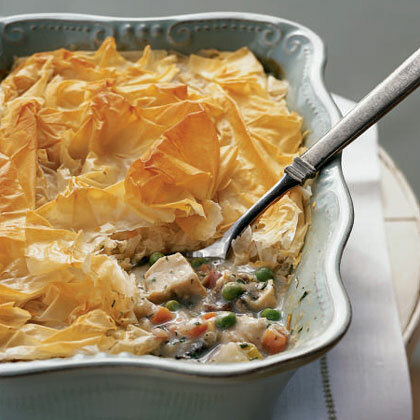 Note: You can substitute the frozen puff pastry with 2 or 3 sheets of Phyllo dough (add one quick spray of non-stick spray between sheets and to the top sheet). Your results will be more like the pie pictured above. Do you eat for comfort? Are you okay with it? What are your favorite healthy comfort foods? What comfort foods would you like help on making healthy? 12 Comments on "CHICKEN POT PIE"
I like your 2 rules! Thats a delicious looking recipe! .-= Marisa (Trim The Fat)s last blog ..Morning Breakdowns + A New Recipe =-. A lovely airy crust with a creamy gravy and fresh veggies below how can you not like it. If you try it, let me know what you think of it. Its also easy to adapt for your own fave veggies or seasonings. By the way, I like your site so much Ive included it in my Im Inspired By category! I prepared this dish. Girls, its so tasty, not otorveshsya. I very much recommend to all to cook. Not regret. Im glad you liked it. Thanks for visiting and I hope youll try other recipes and let us know what you think! .-= Chef Ds last blog ..The toast francais (glutenfreesteve.wordpress.com) =-. Thank you Lesli. Its a great recipe! Even my little son cant get enough of it. Yes, memories of Swanson pot pies as a treat when I was a young child make me crave this comfort food! Ive made this recipe twice and it is absolutely incredible!!! The sweet potato, parsnips, and thyme make this a delicious grown-up version. This is a recipe to pass down to future generations!